Here you will find contact information on Fastavals bunker members and some of the individual organizer areas. The Information is ready to answer all the questions that you may have about Fastaval. The mail will only be answered by Infobosses; Karen Bech Sørensen and Rebecca Møller Alkjær. The bunker is Fastavals main organizers and is responsible for much of the practical before, during and after Fastaval. 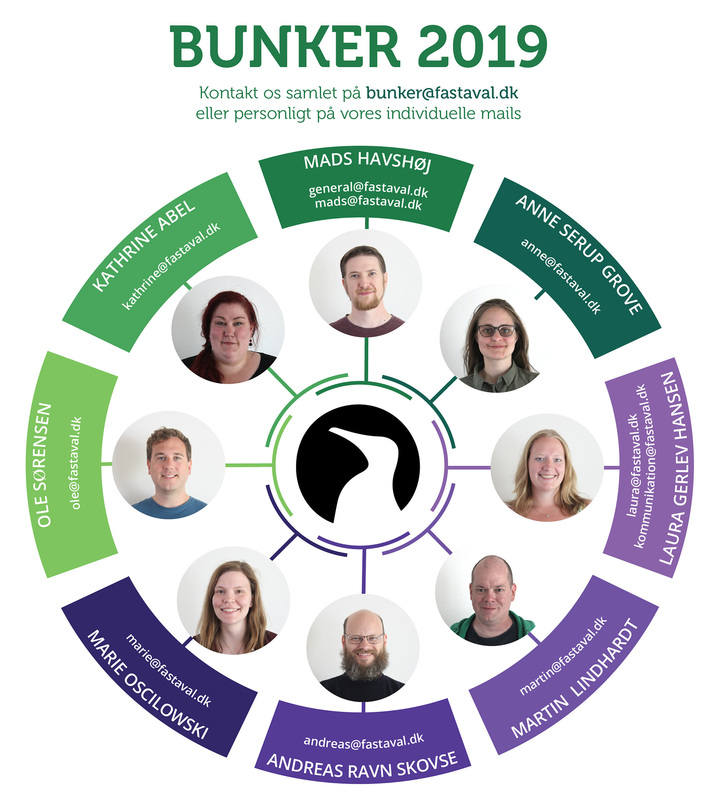 You can contact the bunker at their common mail bunker@fastaval.dk or see the bunker’s individual mail on the overview. Read more about this years’ Bunker here. If you belong to the media, or if you have specific questions or requests press material and communication, contact us here at kommunikation@fastaval.dk. Mails will be answered by Head of Communication, Laura Gerlev Hansen. If you have questions or requests about the specific areas of the organization at Fastaval then contact them directly. If you are in use of contact to the other areas than specified below you are more than welcome to contact the Information on info@fastaval.dk. Mails will be answered by a member of the Board of ALEA. Mails will be answered by Poul Thomsen. Mails will be answered by Max Møller, Morten Lund or Uffe Thomsen. Mails will be answered by Pia Wiid Jakobsen. Mails will be answered by Astrid S. Andersen or Eva Fog. Mails will be answered by Nynne Johanne Bruun Brandt. Mails will be answered by Mads Havshøj. Mails will be answered by Louise Floor Frellsen or Niels Jensen. Mails will be answered by Sofie Falk. Mails will be answered by Anne Serup Grove. Mails will be answered by Kamilla Kate Brichs.